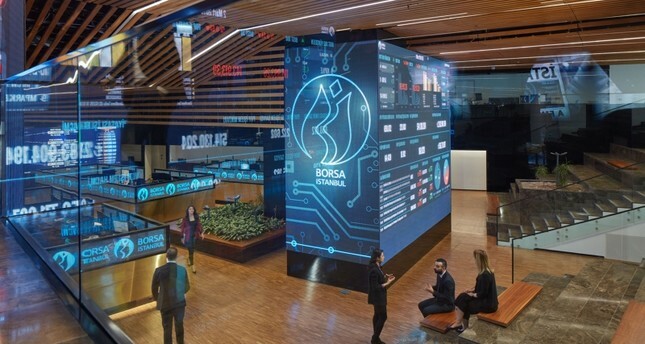 The benchmark index of Turkey's stock exchange Borsa Istanbul (BIST) showed its best January performance in the last 22 years amid rising risk appetite in global markets with the beginning of the New Year. The BIST 100 Index increased by 14.03 percent in January and closed the month at 104,074 points. This increase marked the BIST 100's best performance since Jan. 1997, when the index rose by 64.5 points. Upsetting investors last year with a 20.86 decrease in value on average, BIST 100 closed 2018 at 91,270 points. With the arrival of 2019, the risk appetite rose as the U.S. Federal Reserve (Fed) maintained its dovish tone, prompting a flow of funds to developing markets. With the support from the Central Bank of Republic of Turkey's (CBRT) strong emphasis that it will maintain tight monetary policy, the BIST 100 Index maintained its upward trend and tested 106,000 points level, later retreating to 104,000 level on profit sales. On a monthly scale, all 21 sectorial indexes except for transportation posted gains in January, with communication leading with 20.42 percent increase. It was followed by holdings and investment with 18.76 percent and metal ware and machinery with 18.42 percent. The banking index, which shed 31.30 percent in value amid rising interest rates and slumping Turkish lira in 2018, gained 17.28 percent in January. Transportation was the only index that upset investors with a 1.27 percent retreat. Among the developing markets, BIST 100's performance was only surpassed by Argentina with an average rise of 20 percent, and was followed by Russia at 13.64 percent.